Chinese table tennis emphasizes a lot on Yin Pai. As table tennis strokes require timing, yin pai, and acceleration. I will talk about the very important concept in table tennis “Yin Pai”. So what is In Pai (or “Yin Pai”) and why it is so important? If you know this concept, you will improve very fast. Perfect stroke = Timing + Yin Pai + Acceleration! So what is Yin Pai? What is “Yin Pai” in table tennis? How to do “Yin Pai”? How to remember “Yin Pai” before hitting the ball? “Yin Pai” is the main difference between a pro player and an amateur player. The professional player knows how to prepare before the stroke, and then they make the quality shots. While new players always said, “I don’t have time, the ball is too fast”. Both pro players and amateur players have the same amount of time before the stroke. But pro players know how to use this time, and amateur just wastes this precious time. So today, we learn how to prepare the shots using the Chinese tips “Yin Pai”. I have presented some principal Chinese philosophies in table tennis: “Power From the Ground“, “Hit by the legs“, “Timing and Acceleration“, “Using the wrist“, etc. “Yin Pai” is how Chinese players prepare before hitting the ball. It’s another fundamental in Chinese table tennis coaching that you should know. By applying these Chinese concepts, a player said: “My rating went 200 points up“. Thank you! I’m very happy that my videos help you improve your table tennis. You will improve even faster by applying today’s tips “Yin Pai” – How to prepare for the stroke and increase the quality of the shots. Another player emailed me “I’m searching how to use the wrist in forehand and also in backhand”. I have made a video recently about “using the wrist in the Forehand loop”. Look above for the link. And this is how pro players use the wrist in the backhand stroke. Look at Zhang Jike, how he rotates his wrist in the backhand flick technique. 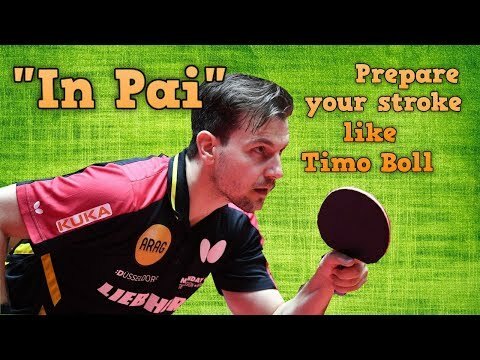 You can hear in many Chinese table tennis coaching videos the word “Yin Pai”. Chinese coach emphasizes a lot this step “Yin Pai” because it is really important. This step decides the quality of the shots. “In” is “to flow”, to let come in. It is like you let the water come in a channel. “Pai” is your racket. So “Yin Pai” is to let your racket flow, or to bring back your racket naturally, to make the space before hitting the ball. But the Chinese philosophy focuses on “let it flow”, so you need to do it naturally, fluidly, in a relaxing way. Some amateur players forget to “Yin Pai”, so don’t have enough time to hit the next ball properly. Or some players “Yin Pai” at the last moment, suddenly, in a forced way, so they can’t accelerate at the right moment, and the quality of the shots decrease. So the verb “In” is very important, it should be translated as “let it flow” but not only “bring back your racket”. It shares the same concept as Bruce Lee. Chinese players focus a lot on this step “Yin Pai”. Because with this step, a player can hit the ball consistently and powerful. It’s not only just “bring back your racket”. But there are 3 steps to do the correct “Yin Pai”. 1. You need to estimate where the ball will bounce up. And get the optimal position. This job is done by your footwork. 2. You need to do the weight-transfer. You need to lower your body, the body mass is transferred from the right foot to the left foot. By doing that, your elbow and the racket is followed naturally. This is the heart of the action “In” – to follow. 3. And at the last moment, contract and send all of this power, begin from the legs to the waist, frap the elbow, to your hand and the racket. Can you see that? Amazing! The Chinese coach “Yin Pai” and hit the ball without forcing, fluidly. He starts slowly, easily but the ball is crazy fast! The “kick effect” is huge! (the ball is fast and has a low bounce). Very difficult to block his ball! Now! You understand that table tennis is very technical. You don’t need to hit violently to make the ball fast. But you need to play fluidly, but with a proper technique, you can make a quality shot (fast and spinny). That’s why you need a very good coach who can teach you the correct techniques. Step by step. The concept is “Yin Pai” is very important, “well prepared for the shot, let the ball coming (to follow), and then transfer the power at the last moment”. Some amateur players don’t let the ball come, and hit too soon! This is the very bad habit! Each time you do it! Remember this concept “Yin Pai”, let the water come into the channel. Don’t rush! “Yin Pai” increases not only the consistency of the shots but also the power of your attack. Look how Fan Zhendong well prepares before looping the backspin ball. So let’s learn how to “Yin Pai” to pivot at the left corner. The principle of “Yin Pai” in this case is the same. First, you need to use the “2 steps footwork” to move around the corner. Look at my videos for this footwork pattern. And then you need to put your body mass on the right foot, lower your racket below the table. And then transfer the weight from the right foot to the left foot, rotate the hip, and snap the elbow, all of this power is sent to your racket and hit the ball. If you don’t “Yin Pai”, how can you have this power? So “Yin Pai” is the first step you need to do. If you are new, learn the technique step by step, you will improve very fast. If you are not new and form a bad habit, change it! Learn from the beginning. Can you see his technique? He plays easily, relaxes but the ball is very fast and spinny. Because he “Yin Pai”, let the ball coming, and then rotates to hit the ball. I really like this concept “Yin Pai” because it can improve my young players quickly. Now let learn how to “Yin Pai” with the ball at the right corner. Again, don’t rush! Rushing is a very very bad habit that many new players make. You need to do the technique step by step. Remember: Table tennis is very technical! You also need to move correctly to the optimal position. Normally, you can apply the “Quick jump footwork pattern”. And again, lower your racket below the table! Let the ball coming (Yin Pai), and put the weight on the right foot to store the energy. And then rotate and hit the ball forward. Now release the energy and accelerate (brush) into the ball. This way, you can make a fast and spinny ball! Remember! If you are new, make the spinny ball first! Because “Spin is consistency”! Can you see that! He plays easily! His ball is spinny and very fast! “Yin Pai, Yin Pai, and Yin Pai”! Don’t rush! You can do that. I will teach you the best Chinese techniques to improve your table tennis. As I coach young players, and sometimes they just forget the “Yin Pai” steps. So they are more passive and the shots are less quality. This is my best tip for you to always remember “Yin Pai” before hitting the ball. If you don’t want to miss the “Yin Pai” step, you should imagine that there is an “invisible” cord connected between the ball and your racket. So if you want to make ball coming, you need to pull the ball. It’s like the ball in the water, so you need to make a channel, and let the water come. So to dig the channel, you need to do the weight transfer, bring back your racket, and let the ball come into this channel. (or this invisible string). If you know this concept, you will mention that all the professional players in table tennis do “Yin Pai”. For example, look at the Korean player “Kim Jung Hoon”. So you should imagine that there is a string, that is connected from your racket to the ball. So you need to pull the string back to make the ball coming toward your body. By doing that, you won’t forget the “Yin Pai”. There is an invisible string between your racket and the ball! So this is another Chinese philosophy in table tennis that I want to present to you. I hope that you can improve quickly your table tennis skills. And please let me know about your progress. Contact me on this page. See you next Ping Sunday! Can you recommend a training camp for adults please, I have been playing one year and I would love to improve, I’m 60 years old and have time on my hands, I’d lovr some training, and be happy to travel, I see adults have asked you before, but I can’t see a reply, do you yourself offer training camps ?